Do you think it possible to have genre-agnostic mechanisms? It seems to me that any resolution mechanics espouses a certain idea of how things ‘should’ resolve, even if only tacitly, which in turn involves some kind of aesthetic idea. Eg. Playing D&D without skill checks involves a certain common-sense fantasy naturalism where the capacities of a PC are assumed to be those of a fairly competent human being. 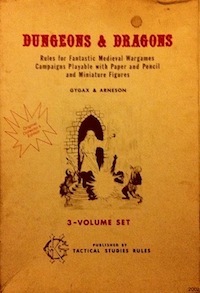 Dungeon World and later edition D&D tend to assume fantasy heroics, where the characters are good at certain things to a degree that approaches superhuman, and that assumption is baked into the resolution mechanics. LotFP assumes you’re bad at pretty much everything unless your class explicitly provides that you’re not, reinforcing the horror feeling by making pretty much everything dangerous. That said, I do hate it when RPGs throw genre in my face, or instruct me to consider genre conventions as a part of task resolution. I wrote the following in a conversation on G+, but I think it applies here. Surely every ruleset has influence (some more, some less) on the possibilities of play. Rules concerned with guaranteeing (or heavily favoring) genre-consistent outcomes are what I mean by genre emulators. I do not think all rulesets behave in this way. Traditional D&D does not, in my experience. My understanding is that genre emulation is usually concerned with making sure the right kinds of things happen, not that the right trappings exist. It seems to me that (to pick a few arbitrary examples) cannon fodder enemies that can’t hit the broad side of a barn and plot immunities are both potentially elements of genre emulation built into game systems. Chekhov’s Gun is only relevant to RPGs if a player character picks it up and shoots it.